A few summers ago, I was in Ithaca working for a start-up and learning how to write code and query a database using SQL and the MySQL framework. Aside from this adventure, I also helped lead an incredibly unique program: the IthaQatar (IQ) Ambassadors program. The IQ program hosted close to 30 pre-medical students from our campus in Doha, Qatar during the summer. We helped them adjust to life on the Ithaca campus and went on a number of adventurous excursions in the surrounding area (such as Niagara falls, Boston and Syracuse). In the process I became very good friends with the leader of the Qatar team—a student named Maen. Maen was originally from Lebanon and was headed into his 3rd year at the medical program in Doha. Maen and I worked closely together via Face to Face (FtF) interaction in planning a number of events—including a large scale dinner event where numerous leaders of the Cornell community and surrounding Ithaca community were in attendance. 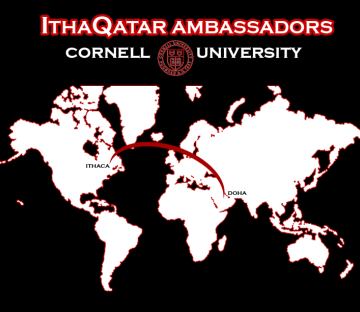 At the end of the summer, before Maen returned to Qatar, the two of us pledged to stay in touch via email in order to continue to bridge our two campuses together and ensure that future generations of Cornellians could benefit from a vibrant interaction between the two undergraduate student bodies. Unfortunately, Computer Mediated Communication (CMC) has been far more challenging than what we had originally assumed. My experience with Maen since he went back to Doha has led me to concur with Walther. Email does not allow for multiplicity of cue systems as there is really only one form of communication: electronic, text based messaging. In addition, feedback is not readily available. Because of the time difference between Ithaca and Doha and our extremely busy schedules it often takes us several days to respond to one another. Language variety is often fairly academic and formal. We rarely resort to colloquial dialect, which in turn causes us to lose a sense of message personalization and our interactions become more business oriented. This sense of business oriented or task-oriented communication is a direct result of CMC. Waltham hypothesizes that the greater the bandwidth—number of communication cue systems a technology can convey—of a technology, the greater the social presence of the communicators utilizing that technology. He also argues that central to a sense of social presence is the availability of non-verbal cues. Thus, CMC is impersonal due to a lack of physical appearance, co-presence and dynamic non verbal behavior. Again, I would have to agree with Waltham. Email has a very low bandwidth—the only available cues are an additional message in one’s inbox. Thus, when Maen and I communicated via email, our social presence was very weak. Being thousands of miles apart, we lacked physical appearance, co-presence and dynamic non verbal behavior. These concepts simply can not flourish in the text based, task oriented nature of email. As a result our relationship—in particular our ability to stay motivated towards the long term goal of uniting the Ithaca and Doha campuses has struggled. Clearly there is a large amount of validity to what Waltham outlines. My own experience with Maen draws to the conclusion that email is both a “lean medium” and has a weak social presence—both concepts predicted by Waltham in the sections “Cues to Choose By” and “Cues Filtered Out.” One interesting application to these theories that Waltham doesn’t really address in his work on mixed mode theories is the concept of CMC in government and foreign policy. Waltham seems to argue that FtF interaction is generally better than CMC. Yet when it comes to foreign policy, diplomacy and international relations not only is CMC far more convenient, it is also far more preferred for many nations, strategically speaking. It would be interesting to see Waltham’s take on this issue.